Are you looking for an easy, fun, holiday themed diy to do today? 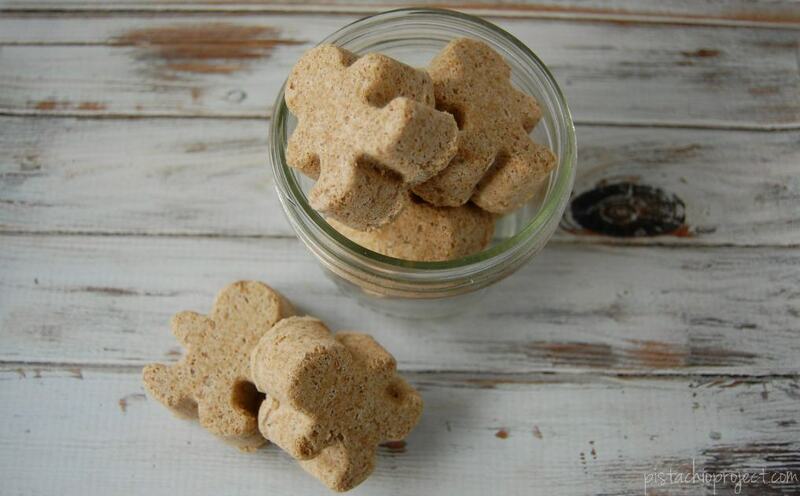 How about some gingerbread bath bombs… that even look like little gingerbread men?! 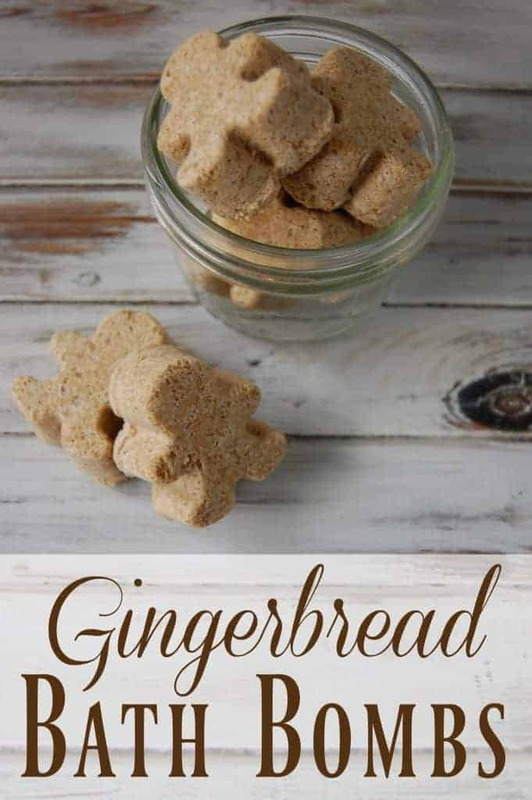 If you are in love with all things gingerbread then this diy is right up your alley! It really should come as no surprise that gingerbread is one of my favorite holiday scents. I’ve made gingerbread sugar scrubs, gingerbread smoothies, gingerbread playdough, even gingerbread pudding! It was only a matter of time before I turned to bath bombs! Bath bombs are quite popular these days. They are a fun way of adding some great nourishing ingredients to your bath. The basic bath bomb ingredients have amazing benefits for your body just on their own. What Ingredients are in these Gingerbread Bath Bombs? Epsom salts have been used for ages for their relaxing properties. It can help relieve sore muscles, pain, and cramps. It can also help your body detox and it’s a nice like magnesium boost too! On top of the basic ingredients, the ingredients that give these bath bombs their gingerbread scent are beneficial too! Cinnamon – Stimulates blood flow. Ginger – Increases blood flow and added to the detox benefits. Molasses – Brightens skin and lightly exfoliating. Plus it gives a bit of natural color. Now I won’t lie, the amount that ends up in your bath will probably not be enough to give you much of those amazing benefits that I just listed above. Usually you need larger amounts to really see a difference, but nonetheless it’s still nice to know that there are some good reasons for adding all these ingredients. These gingerbread bath bombs also make great gifts, especially if you pair them up with my gingerbread cookie sugar scrub! Of course, I won’t blame you if you make them all for yourself either. Add the melted coconut oil and molasses to the dry ingredients and mix well. You want to be able to mold your mixture in your hand but it still needs to be more dry than wet… too wet and you will loose all your fizz before your bath even starts! If you still need a bit more moisture, spray water onto the mixture little by little until the proper consistency is reached. Let them dry for 24 hours before removing them from the mold. Need more DIY holiday skincare ideas? I love this! With your recipe, how many gingerbread men did this make? Thanks that was my question too! These are so cute, can’t wait to try! These are absolutely adorable. Thank you so much for sharing these. I am attempting to handmake most of the gifts I give this year. I think these will be a perfect addition to the women’s gift baskets I’m making. Thank you so much for sharing your recipe. I can’t wait to try them. These are so cute! Thanks for sharing on Homestead Blog Hop! Do you think I could substitute brown sugar or maple syrup for the molasses? Just curious 🙂 I am making these this week – so adorable! I’m not sure that maple syrup would work (it probably wouldn’t give much brown coloring anyway) I’m not sure what sugar in a bath bomb would do…. That said, if it’s simply that you don’t have molasses, you can just leave the molasses out. It’s mainly for coloring. The bath bombs would be more of a light tan without the molasses. Hi! I super recommend never putting sugar in a bath. Sugar mixed with the vaginas natural flora could cause a terrible yeast infection. I followed the recipe and didn’t even add the water but mine are really fizzy and growing / expanding right out of the mold! What do you recommend I try? I actually had a problem because I bought coconut cream (like moisturizer) DUH. After I got the right stuff (I got crisco coconut oil) they came out fantastic! I made these and they are not coming out of the mold with out cracking and arms or legs follow apart. HELP! Did you pack them in really tight? The molasses has a way of making the bath bombs expand a bit and if you don’t press them back down then they might end up to fragile (too much air bubbles). I usually pack them in, let them sit 10-15 mins and then press them back down again. How long will these last if stored in airtight container? Bath bombs last about 6 months before they start loosing their fizzy abilities. The cinnamon that you used should be fine… technically it’s the ginger that gives it the gingerbread smell. You can definitely add more spice to the mixture if you want though!